• Reductions in overall NNI investments for 2018 relative to 2016–2017 and previous years are consistent with the goal of the President’s 2018 Budget to prioritize Federal resources on areas that industry is not likely to support, over later-stage applied research and development that the private sector is better equipped to pursue. • The actual NNI investments reported by the participating agencies for 2016 ($1.56 billion) are significantly larger than 2016 estimated investments published in the 2017 Budget ($1.43 billion) and 2016 requested investments published in the 2016 Budget ($1.50 billion). This change is due largely to the fact that an increasing proportion of agencies’ nanotechnology investments are coming from “core” R&D programs, where the high success rate of nanotechnology-related proposals cannot be anticipated in advance. • Total funding for PCA 1, Nanotechnology Signature Initiatives and Grand Challenges, for 2018 (nearly $200 million, representing over 16% of the NNI total) reflects the emphasis on focused investments in R&D that advances interagency cooperation and public/private partnerships in support of national priorities, as a key part of the overall NNI funding strategy. • The NNI’s Nanotechnology-Inspired Grand Challenge for Future Computing is a new investment category in the President’s 2018 Budget, included for the first time under PCA 1. This challenge helps to address renewed international competition for U.S. leadership in semiconductor manufacturing and downstream information technology industries. For 2016, agencies are reporting over $140 million in investments under the NNI budget crosscut (including related research under the Nanoelectronics NSI) in this sector, which is critical for both national security and economic competitiveness. • The increase in the percentage of total NNI investments in PCA 2, Foundational Research (from 36% in 2016 to nearly 40% in the 2018 Budget) reflects the Budget’s focus on supporting early-stage R&D, and is consistent with calls by NNI advisory bodies to maintain a pipeline of basic research that will lead to the innovations of the future. • Proportional NNI investments in PCA 3 (Nanotechnology-Enabled Applications, Devices, and Systems) hold steady at about 24% of the total NNI investments for 2016–2018, down slightly from 25% in 2015. • NNI agencies continue to provide consistent, proportional funding for PCA 4 (Research Infrastructure and Instrumentation) for 2016–2018, at 15–16% of the NNI total. The 2018 request ($179 million, representing about 15% of the NNI total investment) includes sustained support for NSF’s National Nanotechnology Coordinated Infrastructure network of university-based nanotechnology user facilities. The President’s 2018 Budget for DOE requests continued support for three of the original five Nanoscale Science Research Centers. PCA 4 also includes research to develop novel or improvedinstrumentation, which is critical to continued progress in nanotechnology and to maintain U.S. competitiveness internationally. • PCA 5 (Environment, Health, and Safety—EHS) investments are a key element of the NNI’s strategy to ensure responsible development of nanotechnology. For 2016–2018, the proportional research investments reported under PCA 5 (see Appendix A for definitions) are approximately 6% of the NNI total for 2016 and 2017, and 5.5% in the 2018 Budget. In addition to the PCA 5 investments, some research reported under other PCAs (e.g., PCA 1 and PCA 4) also contributes to the overall EHS research portfolio. • The return of the Department of Justice’s National Institute of Justice (NIJ) to the NNI budget crosscut in the 2018 President’s Budget is another example of where nanotechnology innovations initially funded by basic research agencies are now coming to fruition in R&D programs focused on applications, devices, and systems that directly contribute to national priorities. This entry was posted in nanotechnology, science funding and tagged 2018 NNI budget supplement, Carla Hutton, Lynn L. Bergeson, NNI, US National Nanotechnology Initiative on February 21, 2018 by Maryse de la Giroday. For those of us north of the 49th parallel, it’s Thanksgiving. To everyone who celebrates this holiday on the 2nd Monday of October: Have a wonderful day! Now in its second year, planning for various events and activities is underway at schools, labs, and organizations around the country! 100 Billion Nanometer Dash: a challenge to run #100BillionNanometers (equal to 100 meters), share your pictures and videos, and get added to our online map! 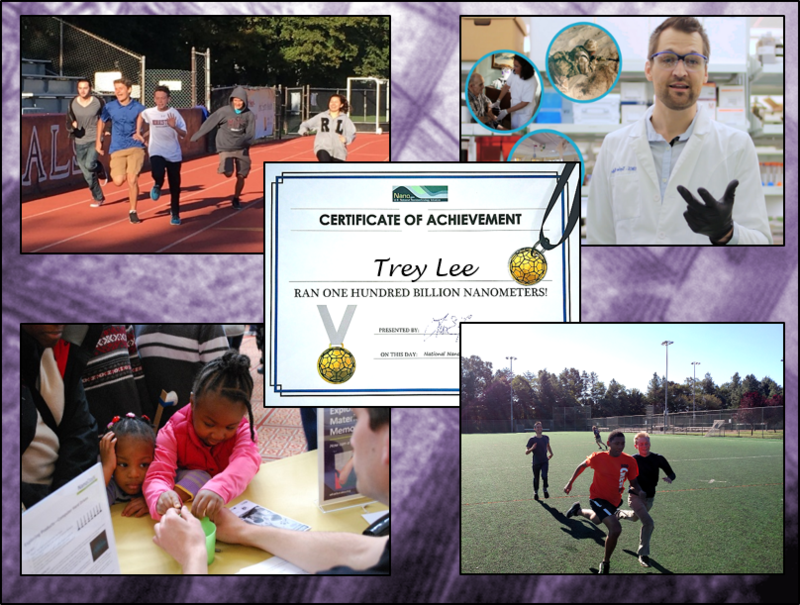 Print a Certificate of Achievement and a gold medal for your runners. Nanotechnology Podcasts: NNCO is producing a series of 5-10 minute podcasts that share stories from the NNI to be launched on National Nano Day. #NationalNanoDay is on October 9th ! Paying homage to the nanometer scale of 10-9 meters, National Nanotechnology Day — held on or around October 9, aka 10/9 — is intended to help raise awareness of nanotechnology and how it’s used in our daily lives, along with the challenges and opportunities it raises for the future. The event will be marked by a series of podcasts produced by the National Nanotechnology Coordination Office (NNCO); the launch of the Gen Nano “superheroes inspired by science” contest for high school students; and the 100 Billion Nanometer Dash. Pallone’s article includes an embedded video introduction to nanotechnology. The National Science Foundation and the National Nanotechnology Initiative are sending up the signal and asking for your help! We’re calling all middle and high school students to gear up and compete in this year’s Generation Nano: Superheroes Inspired by Science challenge! Create a written entry and either a comic or a 90-second video that illustrates your science-powered superhero in action. Winners will receive cash prizes and the opportunity to showcase their creation at the 2018 USA Science & Engineering Festival in Washington, D.C. Your mission is to enter the Gen Nano challenge by January 8! Start here to learn about the competition. April 6-8, 2018 Winners present their displays at 2018 USA Science & Engineering Festival. For anyone curious about the 2017 winners, there’s this July 10, 2017 posting. This entry was posted in nanotechnology, public engagement and tagged 2018 Generation Nano competition, 2018 Generation Nano: Superheroes Inspired by Science, 2018 USA Science & Engineering Festival, Generation Nano, NNCO, NNI, Tony Pallone, US National Nano Day 2017, US National Nanotechnology Coordination Office, US National Nanotechnology Day, US National Nanotechnology Initiative, US National Science Foundation on October 9, 2017 by Maryse de la Giroday. Today [June 6, 2017], the National Science Foundation (NSF), in partnership with the National Nanotechnology Initiative (NNI), named the first- and second-place winners, as well as the People’s Choice winner, for the second annual Generation Nano competition. Generation Nano challenges high school students to imagine novel superheroes who use the power of nanotechnology — technology on the scale of a nanometer, or 1 billionth of a meter — to solve crimes or tackle a societal challenge. Students then tell their hero’s story in a comic and video. Students learn about the science behind nanotechnology before applying nanotechnology-enabled tools and concepts to futuristic characters, said Mihail C. Roco, NSF senior advisor for science and engineering and a key architect of the National Nanotechnology Initiative (NNI). Justice: Defending the defenseless against criminals, bullies, supervillains and others who wish to do harm. Relief: Providing aid to victims of disasters, famine, drought and other situations where people are in need. Health: Striving to heal the sick and injured. Environment: Focusing on clean energy, pollution control and a sustainable future. Generation Nano participants were required to submit a short, written entry about their superheroes, a two- to three-page comic and a 90-second video. A panel of judges with expertise in either nanotechnology or comics evaluated each entry and selected semifinalists and finalists. The public selected the People’s Choice winner from the list of finalists. Paul Weiss, presidential chair and distinguished professor of chemistry and biochemistry and of materials science and engineering at University of California, Los Angeles. Kevin Walsh, associate dean of research for the University of Louisville Speed School of Engineering. Annie Wu, an American illustrator best known for her work in “Black Canary” for DC Comics and “Hawkeye” for Marvel. The winners will be at the NSF booth at Awesome Con in Washington, D.C. June 16-18 , and will also visit Capitol Hill. In addition, each winner is invited to tour the nearest NNI center. Visit the Generation Nano website for competition details, such as eligibility criteria, entry guidelines, timeline, prizes, and videos and comics from the winners and finalists. Congratulations to the winners and all of the entrants! Should you be curious about previous Generation Nano competitions there are some details in my Oct. 7, 2016 posting. This entry was posted in nanotechnology, public engagement, sscience education and tagged 2017 Generation Nano competition, Agent X: 'X' marks the spot, Annie Wu, Daniel Kim, Dilatant: Being bulletproof has never taken such a small effort, environment, Hannah Kim, health, Justice, Kevin Walsh, Lisa Friedersdorf, Marjorie Liu, Mia Kei: Versatility is my specialty, Mihail C. Roco, NNI, NSF, Paul Weiss, Ramona Park, Relief, second annual Generation Nano: Small Science, Symone Crowder, US National Nanotechnology Coordination Office, US National Nanotechnology Initiative, US National Science Foundation on July 10, 2017 by Maryse de la Giroday. The American Innovation and Competitiveness Act (S. 3084) would amend the 21st Century Nanotechnology Research and Development Act (15 U.S.C. § 7501 et seq.) to change the frequency of National Nanotechnology Initiative (NNI) reports. The strategic plan would be released every five instead of every three years, and the triennial review would be renamed the quadrennial review and be prepared every four years instead of every three. The evaluation of the NNI, which is submitted to Congress, would be due every four instead of every three years. … On December 28, 2016, the bill was presented to President Obama. President Obama is expected to sign the bill. Congress.gov is hosting the S.3084 – American Innovation and Competitiveness Act webpage listing all of the actions, to date, taken on behalf of this bill; Obama signed the act on Jan. 6, 2017. One final note, Obama’s last day as US President is Friday, Jan. 20, 2016 but his last ‘full’ day is Thursday, Jan. 19, 2016 (according to a Nov. 4, 2016 posting by Tom Muse for About.com). This entry was posted in nanotechnology, science policy and tagged 21st Century Nanotechnology Research and Development Act, 21st Century Nanotechnology Research and Development Act (15 U.S.C. § 7501 et seq.) US National Nanotechnology Initiative, American Innovation and Competitiveness Act (S. 3084), Barack Obama, Lynn L. Bergeson, NNI, S.3084 - American Innovation and Competitiveness Act on January 9, 2017 by Maryse de la Giroday. After more than a decade, the UCSB Center for Nanotechnology in Society research has provided new and deep knowledge of how technological innovation and social change impact one another. Now, as the national center reaches the end of its term, its three primary research groups have published synthesis reports that bring together important findings from their 11 years of activity. The ever-increasing ability of scientists to manipulate matter on the molecular level brings with it the potential for science fiction-like technologies such as nanoelectronic sensors that would entail “merging tissue with electronics in a way that it becomes difficult to determine where the tissue ends and the electronics begin,” according to a Harvard chemist in a recent CQ Researcher report. While the life-altering ramifications of such technologies are clear, it is less clear how they might impact the larger society to which they are introduced. CNS research, as detailed the reports, addresses such gaps in knowledge. For instance, when anthropologist Barbara Herr Harthorn and her collaborators at the UCSB Center for Nanotechnology in Society (CNS-UCSB), convened public deliberations to discuss the promises and perils of health and human enhancement nanotechnologies, they thought that participants might be concerned about medical risks. However, that is not exactly what they found. Participants were less worried about medical or technological mishaps than about the equitable distribution of the risks and benefits of new technologies and fair procedures for addressing potential problems. That is, they were unconvinced that citizens across the socioeconomic spectrum would share equal access to the benefits of therapies or equal exposure to their pitfalls. In her role as Director of CNS-UCSB, Harthorn has overseen a larger effort to promote the responsible development of sophisticated materials and technologies seen as central to the nation’s economic future. By pursuing this goal, researchers at CNS-UCSB, which closed its doors at the end of the summer, have advanced the role for the social, economic, and behavioral sciences in understanding technological innovation. Harthorn has spent the past 11 years trying to understand public expectations, values, beliefs, and perceptions regarding nanotechnologies. Along with conducting deliberations, she has worked with toxicologists and engineers to examine the environmental and occupational risks of nanotechnologies, determine gaps in the U.S. regulatory system, and survey nanotechnology experts. Work has also expanded to comparative studies of other emerging technologies such as shale oil and gas extraction (fracking). Along with Harthorn’s research group on risk perception and social response, CNS-UCSB housed two other main research groups. One, led by sociologist Richard Appelbaum, studied the impacts of nanotechnology on the global economy. The other, led by historian Patrick McCray, studied the technologies, communities, and individuals that have shaped the direction of nanotechnology research. Appelbaum’s research program included studying how state policies regarding nanotechnology – especially in China and Latin America – has impacted commercialization. Research trips to China elicited a great understanding of that nation’s research culture and its capacity to produce original intellectual property. He also studied the role of international collaboration in spurring technological innovation. As part of this research, his collaborators surveyed and interviewed international STEM graduate students in the United States in order to understand the factors that influence their choice whether to remain abroad or return home. In examining the history of nanotechnology, McCray’s group explained how the microelectronics industry provided a template for what became known as nanotechnology, examined educational policies aimed at training a nano-workforce, and produced a history of the scanning tunneling microscope. They also penned award-winning monographs including McCray’s book, The Visioneers: How a Group of Elite Scientists Pursued Space Colonies, Nanotechnologies, and Limitless Future. Funded as a National Center by the US National Science Foundation in 2005, CNS-UCSB was explicitly intended to enhance the understanding of the relationship between new technologies and their societal context. After more than a decade of funding, CNS-UCSB research has provided a deep understanding of the relationship between technological innovation and social change. New developments in nanotechnology, an area of research that has garnered $24 billion in funding from the U.S. federal government since 2001, impact sectors as far ranging as agriculture, medicine, energy, defense, and construction, posing great challenges for policymakers and regulators who must consider questions of equity, sustainability, occupational and environmental health and safety, economic and educational policy, disruptions to privacy, security and even what it means to be human. (A nanometer is roughly 10,000 times smaller than the diameter of a human hair.) Nanoscale materials are already integrated into food packaging, electronics, solar cells, cosmetics, and pharmaceuticals. They are far in development for drugs that can target specific cells, microscopic spying devices, and quantum computers. Given such real-world applications, it was important to CNS researchers that the results of their work not remain confined within the halls of academia. Therefore, they have delivered testimony to Congress, federal and state agencies (including the National Academies of Science, the Centers for Disease Control and Prevention, the Presidential Council of Advisors on Science and Technology, the U.S. Presidential Bioethics Commission and the National Nanotechnology Initiative), policy outfits (including the Washington Center for Equitable Growth), and international agencies (including the World Bank, European Commission, and World Economic Forum). They’ve collaborated with nongovernmental organizations. They’ve composed policy briefs and op eds, and their work has been covered by numerous news organizations including, recently, NPR, The New Yorker, and Forbes. They have also given many hundreds of lectures to audiences in community groups, schools, and museums. Understanding Nanotechnologies’ Risks and Benefits: Emergence, Expertise and Upstream Participation. 1. Public acceptability of nanotechnologies is driven by: benefit perception, the type of application, and the risk messages transmitted from trusted sources and their stability over time; therefore transparent and responsible risk communication is a critical aspect of acceptability. 2. Social risks, particularly issues of equity and politics, are primary, not secondary, drivers of perception and need to be fully addressed in any new technology development. We have devoted particular attention to studying how gender and race/ethnicity affect both public and expert risk judgments. 4. While nearly half of all international STEM graduate students would like to stay in the U.S. upon graduation, fully 40 percent are undecided — and a main barrier is current U.S. immigration policy. 5. Although representatives from the nanomaterials industry demonstrate relatively high perceived risk regarding engineered nanomaterials, they likewise demonstrate low sensitivity to variance in risks across type of engineered nanomaterials, and a strong disinclination to regulation. This situation puts workers at significant risk and probably requires regulatory action now (beyond the currently favored voluntary or ‘soft law’ approaches). 6. The complex nature of technological ecosystems translates into a variety of actors essential for successful innovation. One species is the Visioneer, a person who blends engineering experience with a transformative vision of the technological future and a willingness to promote this vision to the public and policy makers. Along with successful outreach efforts, CNS-UCSB also flourished when measured by typical academic metrics, including nearly 400 publications and 1,200 talks. In addition to producing groundbreaking interdisciplinary research, CNS-UCSB also produced innovative educational programs, reaching 200 professionals-in-training from the undergraduate to postdoctoral levels. The Center’s educational centerpiece was a graduate fellowship program, referred to as “magical” by an NSF reviewer, that integrated doctoral students from disciplines across the UCSB campus into ongoing social science research projects. For social scientists, working side-by-side with science and engineering students gave them an appreciation for the methods, culture, and ethics of their colleagues in different disciplines. It also led to methodological innovation. For their part, scientists and engineers were able to understand the larger context of their work at the bench. UCSB graduates who participated in CNS’s educational programs have gone on to work as postdocs and professors at universities (including MIT, Stanford, U Penn), policy experts (at organizations like the Science Technology and Policy Institute and the Canadian Institute for Advanced Research), researchers at government agencies (like the National Institute for Standards and Technology), nonprofits (like the Kauffman Foundation), and NGOs. Others work in industry, and some have become entrepreneurs, starting their own businesses. CNS has spawned lines of research that will continue at UCSB and the institutions of collaborators around the world, but its most enduring legacy will be the students it trained. They bring a true understanding of the complex interconnections between technology and society — along with an intellectual toolkit for examining them — to every sector of the economy, and they will continue to pursue a world that is as just as it technologically advanced. Without having read the documents, I’m not sure how to respond but I do have a question. Just how much regulation are they suggesting? I offer all of the people associated with the center my thanks for all their hard work and my gratitude for the support I received from the center when I presented at the Society for the Study of Nanotechnologies and Other Emerging Technology (S.Net) in 2012. I’m glad to see they’re going out with a bang. This entry was posted in nanotechnology, public perceptions, regulation, risk, social implications and tagged Barbara Herr Harthorn, Brandon Fastman, Centers for Disease Control and Prevention, CNS-UCSB, European Commission, Exploring Nanotechnology’s Origins Institutions and Communities: A Ten Year Experiment in Large Scale Collaborative STS Research, Globalization and Nanotechnology: The Role of State Policy and International Collaboration, Nanotechnologies and Limitless Future, NNI, Patrick McCray, policy, Presidential Council of Advisors on Science and Technology (PCAST), Richard Appelbaum, The Visioneers: How a Group of Elite Scientists Pursued Space Colonie, U.S. Presidential Bioethics Commission, UCSB, UCSB Center for Nanotechnology in Society, Understanding Nanotechnologies’ Risks and Benefits: Emergence Expertise and Upstream Participation, University of California at Santa Barbara, US National Academies of Science, US National Nanotechnology Initiative, Washington Center for Equitable Growth, World Bank, World Economic Forum on December 19, 2016 by Maryse de la Giroday. The [US] National Nanotechnology Coordination Office (NNCO) is pleased to announce the release of the new [US 2016] National Nanotechnology Initiative Strategic Plan. Under the 21st Century Nanotechnology Research and Development Act of 2003, NNI agencies are required to develop an updated NNI Strategic Plan every three years. The NNI, a collaboration of twenty Federal agencies and departments, has enabled groundbreaking discoveries that have revolutionized science; established world-class facilities for the characterization of nanoscale materials and their fabrication into nanoscale devices; educated tens of thousands of individuals from undergraduate students to postdoctoral researchers; and fostered the responsible incorporation of nanotechnology into commercial products. NNI investments together with those of industry have transitioned nanotechnology discoveries into a variety of commercial products including apparel, consumer electronics, sporting goods, and automobiles. Nanotechnology is poised to revolutionize the way we diagnose and treat disease, improve our health and fitness, and enable human exploration of Mars. Looking toward the future, nanotechnology is moving from a fundamental research area to an enabling technology that can lead to new materials, devices, and systems that will profoundly impact our quality of life, economy, and national security. The strong collaborations built under the NNI will be critical in sustaining an ecosystem that invests in the next breakthroughs in nanoscale materials and devices but also promotes the effective and responsible transition of nanotechnology discoveries from lab to market. This strategic plan builds upon the collaborations and prior accomplishments of the NNI to develop and nurture that ecosystem and to move the NNI into its next phase. This document represents a consensus among NNI agencies on the high-level goals and priorities of the initiative and on specific objectives to be pursued over at least the next three years. The plan provides the framework under which individual agencies conduct their own mission-specific nanotechnology programs, coordinate these activities with those of other NNI agencies, and collaborate. You can find the report and other related materials on the 2016 Strategic NNI Plan webpage (on the NNI website) or you can to directly to the 2016 Strategic NNI Plan (PDF 66pp.). This entry was posted in nanotechnology and tagged 21st Century Nanotechnology Research and Development Act of 2003, NNCO, NNI, US 2016 National Nanotechnology Initiative Strategic Plan, US National Nanotechnology Coordination Office, US National Nanotechnology Initiative on December 8, 2016 by Maryse de la Giroday. The results from the 3rd SUN annual meeting showed great advancement of the project. The meeting was held in Edinburgh, Scotland, UK on 4-5 October 2016 where the project partners presented the results obtained during the second reporting period of the project. The ultimate goal of the SUN Project is the development of an online software Decision Support System – SUNDS – aimed at estimating and managing occupational, consumer, environmental and public health risks from nanomaterials in real industrial products along their lifecycles. The SUNDS beta prototype has been released last October, 2015, and since then the main focus has been on refining the methodologies and testing them on selected case studies i.e. nano-copper oxide based wood preserving paint and nano- sized colourants for plastic car part: organic pigment and carbon black. Obtained results and open issues were discussed during the third annual meeting in order collect feedbacks from the consortium that will inform, in the next months, the implementation of the final version of the SUNDS software system, due by March 2017. Significant interest has been payed towards the results obtained in WP2 (Lifecycle Thinking) which main objectives are to assess the environmental impacts arising from each life cycle stage of the SUN case studies (i.e. Nano-WC-Cobalt (Tungsten Carbide-cobalt) sintered ceramics, Nanocopper wood preservatives, Carbon Nano Tube (CNT) in plastics, Silicon Dioxide (SiO2) as food additive, Nano-Titanium Dioxide (TiO2) air filter system, Organic pigment in plastics and Nanosilver (Ag) in textiles), and compare them to conventional products with similar uses and functionality, in order to develop and validate criteria and guiding principles for green nano-manufacturing. Specifically, the consortium partner COLOROBBIA CONSULTING S.r.l. expressed its willingness to exploit the results obtained from the life cycle assessment analysis related to nanoTiO2 in their industrial applications. On 6th October , the discussions about the SUNDS advancement continued during a Stakeholder Workshop, where representatives from industry, regulatory and insurance sectors shared their feedback on the use of the decision support system. The recommendations collected during the workshop will be used for the further refinement and implemented in the final version of the software which will be released by March 2017. The project has designed its final events to serve as an effective platform to communicate the main results achieved in its course within the Nanosafety community and bridge them to a wider audience addressing the emerging risks of Key Enabling Technologies (KETs). The series of events include the New Tools and Approaches for Nanomaterial Safety Assessment: A joint conference organized by NANOSOLUTIONS, SUN, NanoMILE, GUIDEnano and eNanoMapper to be held on 7 – 9 February 2017 in Malaga, Spain, the SUN-CaLIBRAte Stakeholders workshop to be held on 28 February – 1 March 2017 in Venice, Italy and the SRA Policy Forum: Risk Governance for Key Enabling Technologies to be held on 1- 3 March in Venice, Italy. Jointly organized by the Society for Risk Analysis (SRA) and the SUN Project, the SRA Policy Forum will address current efforts put towards refining the risk governance of emerging technologies through the integration of traditional risk analytic tools alongside considerations of social and economic concerns. The parallel sessions will be organized in 4 tracks: Risk analysis of engineered nanomaterials along product lifecycle, Risks and benefits of emerging technologies used in medical applications, Challenges of governing SynBio and Biotech, and Methods and tools for risk governance. During the SUN-caLIBRAte Stakeholder workshop the final version of the SUN user-friendly, software-based Decision Support System (SUNDS) for managing the environmental, economic and social impacts of nanotechnologies will be presented and discussed with its end users: industries, regulators and insurance sector representatives. The results from the discussion will be used as a foundation of the development of the caLIBRAte’s Risk Governance framework for assessment and management of human and environmental risks of MN and MN-enabled products. The SRA Policy Forum: Risk Governance for Key Enabling Technologies and the New Tools and Approaches for Nanomaterial Safety Assessment conference are now open for registration. Abstracts for the SRA Policy Forum can be submitted till 15th November 2016. This entry was posted in environment, nanotechnology, risk and tagged Adam Arkin, André Nel, Antonio Marcomini, Barry Hardy, BASF, Belgium, Bernd Nowack EMPA, biotech, Bulgaria, Ca’ Foscari University of Venice, Carbon Nano Tube (CNT) in plastics, COLOROBBIA CONSULTING, Danail Hristozov, Denmark, Denmark National Research Centre for the Working Environment, Douglas Connect, École Polytechnique Fédérale de Lausanne, Egon Willighagen, Elke Anklam, eNanoMapper, EPFL, European Commission, Eva Valsami-Jones, Finland, Gerard Escher, Germany, Greece, GUIDEnano, Haralambos Sarimveis, Harri Alenius, Harvard University, Heriot-Watt University, IDEAconsult, Italy, James Lambert, Keld Alstrup Jensen, LEITAT Technolоgical Center, Lisa Friedersdor (National Nanotechnology Initiative, Maastricht University, Nano-Titanium Dioxide (TiO2) air filter system, NanoMILE, Nanosilver (Ag) in textiles), Nanosolutions, nanoTiO2, Netherlands, Netherlands National Institute for Public Health and the Environment (RIVM), New Tools and Approaches for Nanomaterial Safety Assessment, New Tools and Approaches for Nanomaterial Safety Assessment (NMSA) conference, Nina Jeliazkova, NNI, Organic pigment in plastics, Ortwin Renn, Phil Demokritou, Silicon Dioxide (SiO2) as food additive, Society for Risk Analysis, Society for Risk Analysis (SRA), Socorro Vázquez-Campos, Spain, SRA Policy Forum: Risk Governance for Key Enabling Technologies, SUN, SUN Project, SUN-CaLIBRAte Stakeholders workshop, Sustainable Nanotechnologies (SUN), Switzerland, synbio, The National Technical University of Athens, The Netherlands, the SRA Policy Forum, Theo Vermeire, Tom van Teunenbroek, UK, University of Birmingham, University of California at Berkeley, University of California at Los Angeles, University of Helsinki, University of Stuttgart, US, Vicki Stone, Wendel Wohlleben on December 7, 2016 by Maryse de la Giroday. This interactive map shows the currently funded NNI Centers and User Facilities, as well as the nation’s higher education nanotechnology degrees– from community college through PhD programs. With this interactive map tool, you can search for nanotechnology-related higher education and training programs, NNI Centers and User Facilities, as well as regional, state, and local initiatives in nanotechnology located throughout the country. In addition, the map provides the location of the facility, as well as a street view, directions to the site, and a link to the facility’s website. You can narrow your search results by using the filter criteria and limit your search to your areas of interest, e.g., checking or unchecking the boxes or choosing a state from the drop down menu. Alternatively, you can search by keyword or phrase and the results will be populated in tabular format under the map. Type “all” and all results will be displayed. Clicking on a state will open a new window that displays the map of that state and the statewide results under the map as defined in the search criteria. Clicking on a point on the map or a row in the table, will display more information about that particular institution. From the main map, you can toggle the view at anytime between the state totals map and the cluster map that shows nationwide results. This entry was posted in education, nanotechnology and tagged Nanotechnology Resource Map, NNI, NNI Interactive Nanotechnology Resource Map, US, US Nanotechnology Resource Map: Higher Ed Programs and NNI Centers and User Facilities, US National Nanotechnology Inititative on November 21, 2016 by Maryse de la Giroday. Panelists include Nora Savage (National Science Foundation), Daniel Barta (National Aeronautics and Space Adminstration), Paul Shapiro (U.S. Environmental Protection Agency), Jim Dobrowolski (USDA National Institute of Food and Agriculture), and Hongda Chen (USDA National Institute of Food and Agriculture). Webinar viewers will be able to submit questions for the panelists to answer during the Q&A period. Submitted questions will be considered in the order received and may be posted on the NNI website. A moderator will identify relevant questions and pose them to the speakers. Due to time constraints, not all questions may be addressed during the webinar. The moderator reserves the right to group similar questions and to skip questions, as appropriate. Improve the efficiency of water delivery and use. Enable next-generation water monitoring systems. You can register here to participate. Water is essential to all life, and its significance bridges many critical areas for society: food, energy, security, and the environment. Projected population growth in the coming decades and associated increases in demands for water exacerbate the mounting pressure to address water sustainability. Yet, only 2.5% of the world’s water is fresh water, and some of the most severe impacts of climate change are on our country’s water resources. For example, in 2012, droughts affected about two-thirds of the continental United States, impacting water supplies, tourism, transportation, energy, and fisheries – costing the agricultural sector alone $30 billion. In addition, the ground water in many of the Nation’s aquifers is being depleted at unsustainable rates, which necessitates drilling ever deeper to tap groundwater resources. Finally, water infrastructure is a critically important but sometimes overlooked aspect of water treatment and distribution. Both technological and sociopolitical solutions are required to address these problems. The text also goes on to describe how nanotechnology could assist with this challenge. This entry was posted in Uncategorized and tagged Daniel Barta, EPA, Hongda Chen, Jim Dobrowolski, NASA, National Aeronautics and Space Adminstration, NNI, Nora Savage, NSF, Paul Shapiro, U.S. Environmental Protection Agency, US Department of Agriculture, US Dept. of Agriculture, US Nanotechnology Signature Initiative (NSI): Water Sustainability through Nanotechnology, US National Nanotechnology Initiative, US National Science Foundation, USDA, USDA National Institute of Food and Agriculture, Water Sustainability through Nanotechnology: A Federal Perspective, Water Sustainability through Nanotechnology: Nanoscale Solutions for a Global-Scale Challenge on October 11, 2016 by Maryse de la Giroday. WHIZ! POW! BAM! BOOM! Today [Oct. 5, 2016], the National Science Foundation (NSF) and the National Nanotechnology Initiative (NNI) announce the opening of the second annual Generation Nano: Small Science, Superheroes! competition. The contest invites U.S. high school and home-schooled students to create a superhero that uses nanotechnology — science and technology on the scale of a nanometer, or one billionth of a meter — to solve crimes and meet today’s challenges. By challenging students to think big (or small, in this case) to create superheroes with nanotechnology-inspired gear or powers, NSF and NNI aim to promote an early interest in science, technology, engineering and mathematics (STEM). Last year’s first-ever Generation Nano competition inspired entries from more than 115 students across the U.S. The winning superhero creations included Nanoman, who battled a malignant crab-monster named Cancer; Radio Blitz, who helped dispose of local waste; and Nine, a rising superhero who used his nanosuit to defeat a pair of kidnappers. Actor Wil Wheaton hosted the awards ceremony at the 2016 USA Science & Engineering Festival in Washington, D.C., where legendary comic book creator Stan Lee made a surprise virtual appearance to congratulate the finalists. Justice — Using nanotechnology to fight criminals, bullies, supervillains and other wrongdoers. Relief — Using nanotechnology to aid victims of famine, drought and other disasters. Health — Using nanotechnology to heal the sick and injured. Environment — Using nanotechnology to generate clean energy, control pollution and create a sustainable future. NSF will promote the opening of the competition this week at New York Comic Con, the East Coast’s largest popular culture convention. A panel will bring together NSF-funded scientists and storytellers to talk about their imagined worlds. Student contestants are encouraged to submit their superhero creations to the Generation Nano competition website for an opportunity to compete for prizes. A panel will review the submissions and select 15 semifinalists, and then a first and second place winner. Submissions from all semifinalists will also be posted to the Generation Nano website to allow the public to vote for their favorite superhero, which will receive a People’s Choice award. U.S. high school and home-schooled students should submit a written entry explaining how their superhero uses nanotechnology to do good, along with a two-to-three-page comic and 90-second video. Competition opens Oct. 5, 2016, and submissions are due by midnight, Jan. 31, 2017 EST. Three rounds of judging will take place, with winners announced in the spring. Prizes: $1,500 for first place; $1,000 for second place; and $750 for the People’s Choice award. Visit the Generation Nano competition website for full eligibility criteria, entry guidelines, timeline and prize information. For additional questions about the contest, contact the Generation Nano team at gennano@nsf.gov. As noted in the news release, the competition opened Oct. 5, 2016 and entries can be submitted until Jan. 31, 2017 and you need to submit a written piece, a 2-3 page comic, and a short video. This entry was posted in nanotechnology, public engagement, sscience education and tagged 2016 USA Science & Engineering Festival, Generation Nano competition, Lisa Friedersdorf, Mihail Roco, Nanoman, New York Comic Con, Nine, NNCO, NNI, NSF, Radio Blitz, science technology engineering and mathematics (STEM), second annual Generation Nano: Small Science, Stan Lee, Superheroes! competition, US National Nanotechnology Coordination Office, US National Nanotechnology Initiative, US National Science Foundation, Wil Wheaton on October 7, 2016 by Maryse de la Giroday.